Image courtesy of Advocate.comUPDATE: McCance apologized on CNN.com for his comments and announced that he will resign from the school board. 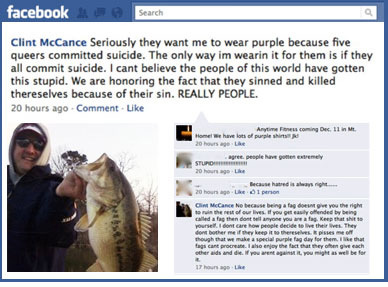 Thus far Cilnt McCance hasn’t explained his antigay remarks. Meanwhile, a Facebook page is calling for McCance to be fired. The page had 17,589 members as of 3pm EST Wednesday. Does this mean he’ll get to keep his job?